Cigar smokers are all Wall Street fat cats who are condescending, elitist snobs that are out of touch with everyday, hard-working Americans. That’s how Hollywood often portrays us lovers of the leaf, and many non-smokers simply accept this stereotype as reality. While you and I know that nothing could be further from the truth—that cigars are an affordable luxury enjoyed by wearers of blue collars and white collars alike—it’s important to keep this stereotype in mind. We should do our best not to reinforce it, especially when we’re around non-smokers. This is best accomplished by adhering to a reasonable code of conduct. Where to smoke. When you’re smoking on your own property alone, you can obviously feel free to smoke away. But if you have a non-smoking guest in your presence, it never hurts to ask. “I’d like to smoke a cigar. Do you mind?” In my experience, rarely, if ever, will the guest object. But he or she will always appreciate your thoughtfulness. Share, don’t impose. Whether you’re about to smoke at home or out on the town, don’t hesitate to offer others in your group a cigar. But remember that offering is a lot different than pressuring. Conversely, if you’ve accepted the gift of a cigar, be sure to reciprocate the generosity next time. No one likes a mooch. Ash in an ashtray. Floors, potted plants, and toilets are not ashtrays and should not be treated as such. Be respectful of your surroundings. If you’re somewhere falling ash won’t be a problem (say, on a golf course), go ahead and let your ash accumulate for an inch or more. But if you’re at a fancy cocktail party standing on a $15,000 Persian rug, ash early and ash often. Remove the band when you want to. While some say it’s showy and impolite to leave the band on your cigar while you smoke it, I couldn’t disagree more. In my experience, leaving the band on is a great conversation starter that helps cigar aficionados meet one another. It also minimizes the risk of the band’s glue from tearing or unraveling a fragile cigar wrapper. Don’t accept a cigar you don’t want or don’t have time for. If you’re lucky enough to be on the receiving end of cigar generosity, politely decline if you don’t have the inclination or time to fully enjoy the smoke. It can be perceived as rude to accept a cigar and then set it down at the halfway mark. Be a good cigar customer. 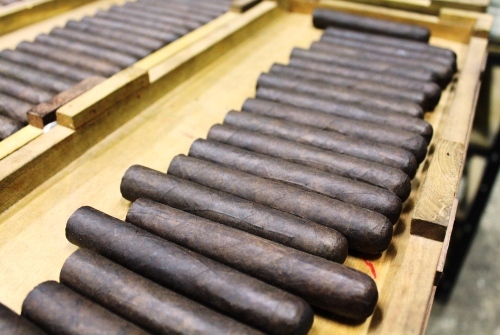 When visiting a cigar shop, handle the merchandise with care and follow the proprietor’s rules. Damaging the cigars (even slightly), shoving the product up your nose, disrupting the display, taking un-purchased merchandise into the bathroom, smoking cigars in the shop/lounge you purchased elsewhere, and other errors of common sense should be avoided. On the whole, cigar enthusiasts are among the nicest, most personable people on the planet—a far cry from how we’re portrayed in movies or on TV. Let’s all do our part to keep it that way. Pass on the knowledge you’ve accumulated, but be open and mindful of other opinions. Pay generosity forward. Treat others as you would like to be treated. And have a great time.